Houston Police Department: What would you do? Since I am currently out of town on a recruiting trip and out of the office away from my assortment of available media, I thought I would post a funny story about my first day off of probation. Back when I joined HPD you only had to be 19. I was 19. My first day off of probation they gave me a patrol car and a radio and told me I was on my own that day, no partner. It was a strange yet exciting feeling as I got behind the wheel of the police car by myself. Heck, I think my voice was still changing, I was so young. I was on the street, on patrol, when within the first ten minutes of my shift an incident occurred. Not a big incident, but an incident. 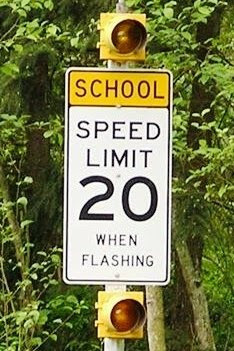 I was traveling 20 mph in a 20 mph school zone when I noticed a car pass me doing about 40 mph in the school zone. This is it, my first incident on my own! I pulled this violator over to tell him of the dangers of speeding in a school zone. This a dangerous situation and I was concerned for all the children that could get hurt walking to school. I walked up to the window and asked the very polite gentleman for his license and insurance. The man was very cooperative and complied with my request. I walked back to my patrol car to write the ticket. As I began to write the ticket, I checked the date and realized at that point it was SATURDAY! Holy cow. What now? I walked backed up to the poor soul and politely told him I had the wrong car and he was free to leave. Part of police work involves common sense and quick thinking on your feet. Normally not for these kind of situations. That is great! This is why I love the blog. You guys are not a bunch of faceless people. You are real. I want to be part of this family. 12 more semester hours and I am yours. I have never seen anything like this on any other website. Please keep posting as much as you can. It will hold me over until I can become a HPD officer.